Only today, just few hours ago, I have found your website and by the way, your site is one of the best ones I have ever seen, designed and devoted to our timeless 'Pieces Of Art On Wheels', to the worldwide spread & famous, loved and used Pininfarina Spiders. Myself, I am an Italian sportscar collector. My 'Spider-connection' and involvement with the 124 Spiders started 40 years ago. I had and enjoyed many of them. 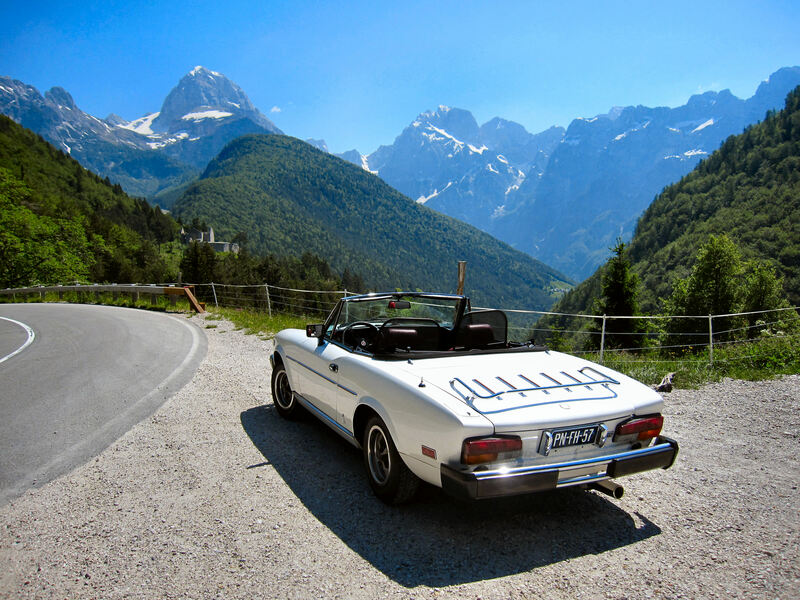 In the late 60' I lived in Bavaria, when I bought my 1st 124 Spider, a 1400 ccm AS model. I remember driving my Spiders even during the winter, when going skiing in the Alps! From the late 70' I lived for 7 years in South Africa and there, I have found and also bought the only 2 Spiders available (in the whole country). Of course, I did restore them too, and drove them all over. I made few long trips in South Africa and several times I visited even the Cape of Good Hope with my black 1968 AS Spider. In 1984 I moved to California and of course, soon I have found new Spiders and drove them all along the Pacific coast from Mexico to Oregon and all across the USA. In an 1983 DS Spider I drove from Los Angeles, along the Route 66, all the way to Chicago and Detroit. I was close to the Niagara falls, have crossed America from North to South, to Georgia and Florida. And at all times I had at least a few Fiat 124 Spiders in my garage. Then in 1996 I did move my vintage car collection back to Europe. There were 11 cars, those that I 'could not' leave behind and 'had' to ship from Los Angeles to Bremen. Later, one by one, I drove them down to the Mediterranean, back to the roots, to Croatia. Since then, I have sold a few of them, as the storage/ parking space has become a problem here. Soon after I moved here, in 1997 I founded our Spider Club Croatia. Croatia has a population of just about 4,6 mill. and the total amount of Spiders in Croatia is only 16, and two of them serve just as parts donors. Myself and few others from our Club here are very active, and we do take part on various Vintage Car Rally events along the beautiful Croatian coast. Now, the next Rally (1000 km Dalmacija Rally, a 4 days event). starts in Split and ends in the National Park Plitvice Lakes. The organizer of that big Rally Event is the SPLITSKI OLDTIMER AUTO CLUB, and only sports cars and roadsters can take part in it. Cars from the 50' up to 1977. It would be nice to meet some new Spider enthusiasts / friends, and for sure it will be again an unforgettable Spider tour, with the top down along the Adriatic coast, over to the Islands, then to Dubrovnik and back to Split and in the mountains to Plitvice Lakes National Park. If needed, I can arrange accommodation before and after the Rally, here on the Northern coast where I am at, or in Dubrovnik where one other Spider Club Croatia member has too rooms/apartments to rent, right down on the water. I have a lot of interesting pictures to share and would like to send you some, from our SCC members cars and also some with my own cars, taken during the Rallys and all along the Adriatic coast and the Islands here. Now I hope to hear from you and may be even meet you and some of your Spider enthusiasts, here in Croatia for the round trip or when ever you feel like having a nice long trip along the Adriatic coast .. with the top down. All the best and my regards to You Anthony and to all of your Spider enthusiasts too. A SERIE OF WONDERFUL PICTURES makes my mouth water . . . .
And a lot of video's HERE . An idea to go southward next year ? Anyway . . . . your Spider should be in top-condition: distance Arnhem - Split = 1638 km.